PARROTS 2018 - Coming this July! AUSTRALIA’S PREMIER AVICULTURAL CONVENTION 6-7-8 JULY 2018. Ready to join us for our International Avicultural Convention? 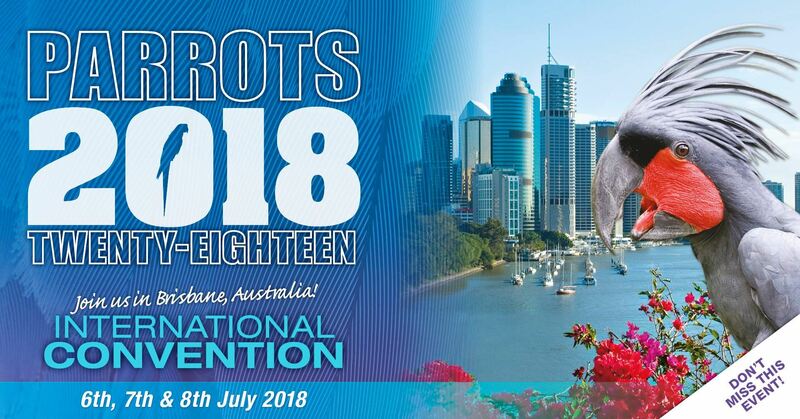 Parrots 2018, the Parrot Society of Australia’s 10th international biennial convention, continues the theme of “Raising the Perch in Avicultural Education” with a lecture program designed to the widest audience of bird enthusiasts, topics of both interest and educational value are on offer. The comprehensive programme offers approximately 22 sessions to choose from over the weekend and is the only convention in Australasia catering to parrot breeders, veterinary staff, pet shop employees, companion parrot owners, zookeepers, young bird keepers and conservationists alike. The diversity of our unique program is something that we are very proud of and gives you, as a delegate, a plethora of choice during the 2-day convention and, as with previous Parrot Conventions, P2018 will continue with the concurrent program of lectures. Each stream is designed to appeal either to those seeking breeding and husbandry based knowledge or to those with interests in the behavioural and enrichment aspects of aviculture and delegates can tailor the programme to meet their own interests. As well as the abundance of up-to-date information based on sound research and personal lessons from experienced aviculturists, P2018 offers you the chance to meet other people whose interests match your own, and the chance to socialise and network with others in the bird keeping community. Heaps of speakers, from Australia and across the Globe. We've livened it up even more by inviting world-renowned experts that have never spoken in Australia before! To hear them first, you have to be at PARROTS 2018! Parrot Trust of Australia Conservation Dinner. The topic is on the incredible Night Parrot, by a hands-on expert with this species - you can't get much better than that! Special guests, including the brains behind some of Aviculture's greatest parrot diets and research institutions. Now, these are just the highlights - there is so much more crammed into this one weekend! So SHARE & TAG your bird mates - Parrots 2018 is just around the corner and space is limited! This is one Convention you don't want to miss!